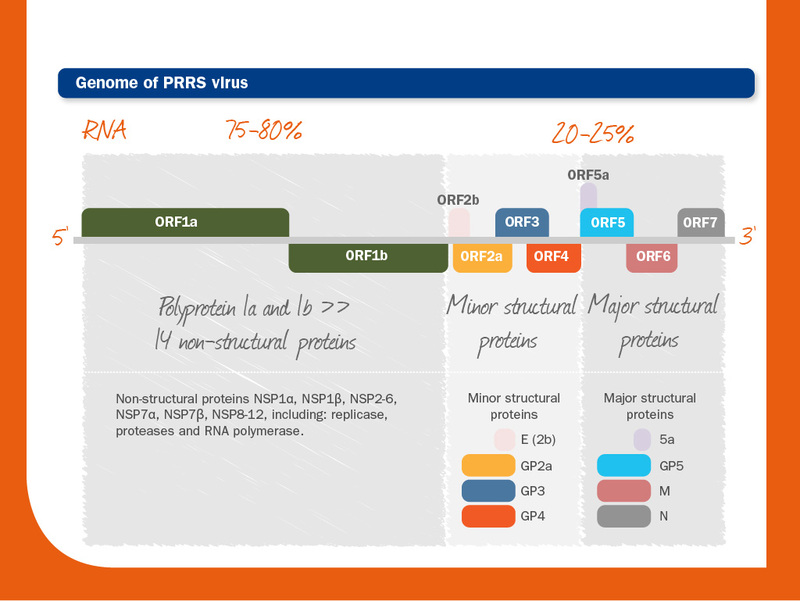 PRRS virus contains a non-segmented, single-stranded, positive-sense RNA genome. The RNA genome comprise at least ten open reading frames (ORFs); its size is approximately 15 kilobases. Downstream the 5’-UTR, the ORFs 1a and 1b are translated in two poly-proteins (pp1a and pp1b) that after cleavage yield 14 non-structural proteins (Nsp’s), including four proteases, the RNA-dependent RNA polymerase, the helicase and an endoribonuclease. These proteins are expressed only during the replication and they are not part of the virion. The eight viral structural proteins are encoded by ORFs 2-7. 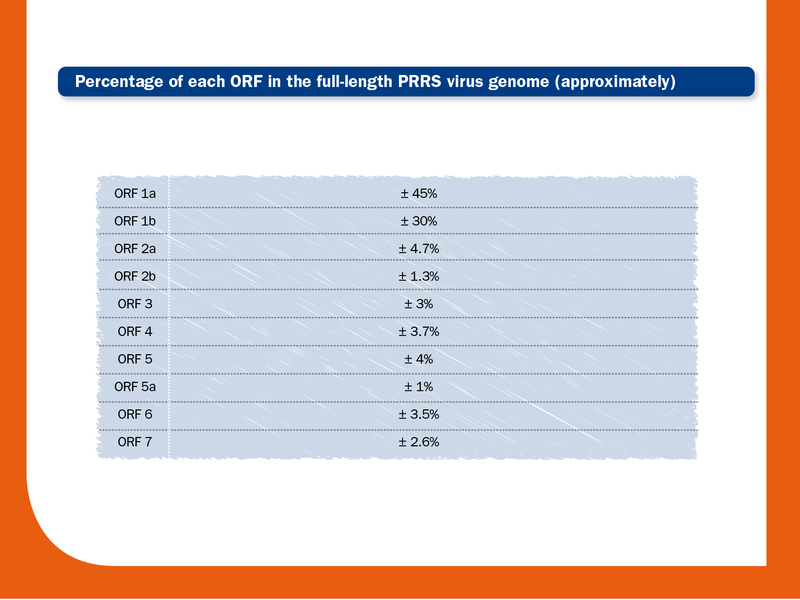 ORFs downstream of ORF1b until the 3’ end, there are eight ORFs (ORF2a, ORF2b, ORF3, ORF4, ORF5, ORF5a, ORF6 and ORF7) that encode for viral structural proteins. Minor structural proteins: three N-glycosylated: GP2a, GP3 and GP4that form a trimeric envelop protein complex, and one non-glycosylated: E or 2b. The trimeric complex, alone or through the interaction with GP5 is essential for viral infectivity. Protein E also interacts with the trimeric complex and is important for the viral replication and for the cellular tropism of the virus. Major structural proteins: major envelope glycoprotein GP5, membrane non-glycosylated protein M, and nucleocapsid protein N. GP5 and M form heterodimers that are essential for virion formation and for the viral infectivity. Also, a novel structural protein called ORF5a has been recently described; it may be essential for cell tropism, replication process and viability of the virion. N protein, encoded by ORF7, interacts with the viral RNA in the assembly of the infectious particle. It is largely used as an antigen in diagnostic assays due to its abundant expression and its antigenicity. 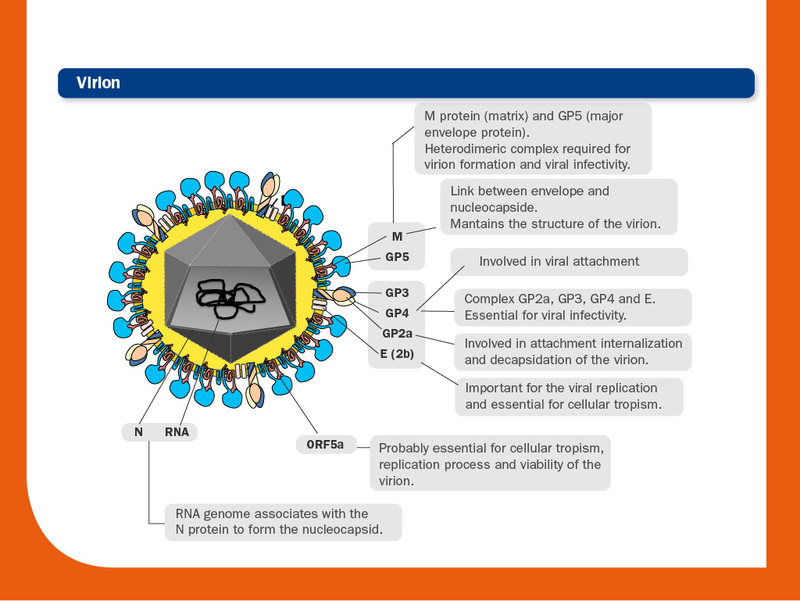 The virion RNA serves as both genome and viral RNA messenger; therefore, it can directly encode the proteins. The PRRS virion is spherical, about 45-80 nm in diameter. Recently, cryo-electron tomographic studies have suggested that the viral nucleocapsid has an asymmetric shape, rather than the isometric core previously assumed. The nucleocapsid, which is formed by the N protein and the RNA genome, is surrounded by the lipid-containing envelope.